The hero of Lost Stories is the hapless I.M. Lost, whom we see on the cover of issue #1, falling through an interdimensional hole between earth and the world of all lost things, where he finds himself on a quest to find his long-lost father. As you can no doubt tell, Lost Stories doesn't take itself too seriously. It's a light-hearted adventure series with slightly cartoony artwork. In ways it reminds me of Leave it to Chance or Scott McCloud's Zot! The story starts out with the teenaged I.M. being plagued by a pair of lawn gnomes who have a fondness for making his things -- homework, underwear, term papers -- disappear. Eventually, the drag him down a well, through an inter-dimensional hole into the World of All Lost Things, where he meets animated clouds, giants, and disembodied Lost Souls. Soon he is off on a quest. I think the thing that most draws me to Lost Stories is that it has fun telling an absolutely classic heroic tale. The story starts with our hero crossing the threshold of the Other World, beginning a journey of self discovery, in this case the search for his lost father, who vanished before he was born. This is exactly the way that the classic heroic cycle begins, and so I expect we'll see that cycle followed. 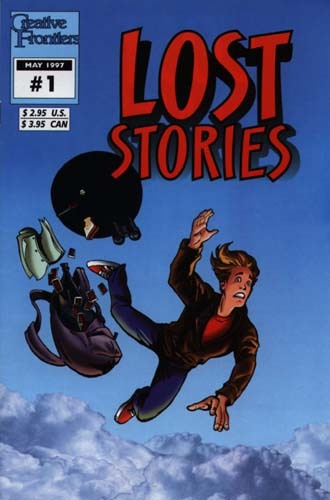 The fact that the creators say that like Bone and The Sandman, Lost Stories is a finite series suggests that they may in fact follow the cycle's structure. There have only been two issues so far, so it's hard to tell if it really will follow the heroic cycle, but the hints and promise are there. The book is self-published. John Riley wrote and Garrett Berner did the pencils. Production and editing are credited to Elaine Riley and Christina Berner, and the cover is inked by Eric Berner. Self-publishing is always risky, but it does give a certain freedom, and it can work. (Take a look at Wendy and Richard Pini's WaRP Graphics for an excellent example.) It does need support, though, so go out and buy a copy of Lost Stories. I really think you'll find this worthwhile. These guys are talented. Riley tells an interesting and imaginative story and if he isn't consciously following the classic form, then he's got awfully good instincts. Either bodes well. He does a good job of characterization, too. Each of the characters has their own voice and style. Berner's art excellently complements Riley's story. Like so many of the artists I've reviewed here, he has a sharp clean style. The style is a bit cartoonish, but sacrifices none of the illustrator's art. The picture to the right of I.M. diving after the gnomes is fairly typical, neither the best nor worst that appears in the first two issues. So there you have it: another book with sharp clean illustration, a solid story, good characterization, featuring a heroic figure, suitable for any age group. So far we don't have a strong female character, with the possible exception of the floof -- an animated cloud-girl -- but otherwise this book hits most of the major positive trends that I see in comics today. Go out and buy Lost Stories. The third issue is due out any day now.